This week, i’ll be breaking down my treatment of the drum tracks for the mix I did for Hot Panda’s song “Slow riser” off their album Bad Pop. If you’re into indie rock, and haven’t checked out Hot Panda, do it! They’re amazing. This video shows you my go-to drum parallel buss compression chain. It adds definition, attack, and volume to my drums in a mix! I use this chain on 90 percent of rock songs I mix, as well as a modified version of this for many pop productions. Here you can see me break down exactly how I treated all of the close mics in this mix. This is a unique example in a few ways. 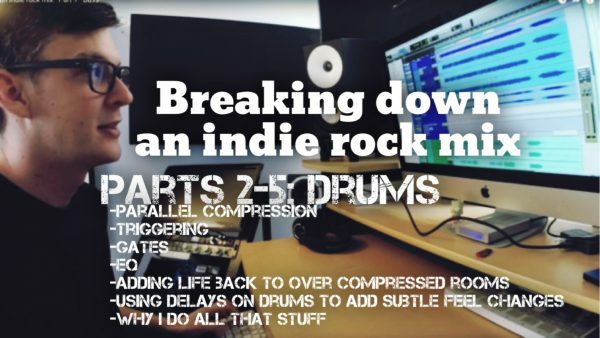 Mainly the drums being very heavily processed when I got them, so i’m not doing a ton of extra compression. The most interesting part of this video, in my opinion, is the use of gating being triggered by a key input from another mic. This video is particularly interesting! I do something I think is pretty cool to give the snare and kick some more life an impact in the squashed room mics. In this one I go over what reverb was used on the drums, show you the resonances I got rid of on the drum master buss, as well as go into detail about how I added a delayed snare in the build section to add an almost subliminal rhythmic element to the mix that really impacted the feel of the section for me.